Do you ever struggle to follow through on an assignment because it feels pointless? A client of mine was recently complaining about the pointlessness of his English class assignments, and you’d better believe this isn’t the first time a student has struggled to find his teacher’s assignments meaningful or relevant to his life. I helped him explore whether it is true that his class is pointless, and at the end of the investigation, we came up with a fascinating way to make it pointFULL instead. Tune in to find out what we came up with. He said, “Oh, maybe with every question the teacher asks I could give a class analysis for it.” Class analysis, not like “school classes” but societal classes. Anyways, I said sure, why not? Maybe not in writing each time, but in his head, he could definitely be thinking about the questions from that point of view, that way it would feel to him more meaningful. So he’s going to be trying that this next week, and I’m super excited to see how it goes for him. In the meantime, I want to walk you all through these 3 steps that he and I went through. You are the one responsible for the sense of meaning in your life. Not your teachers or parents. Sure it’s nice if they contribute to the meaning of your life, but you are the one who’s responsible for the meaning. 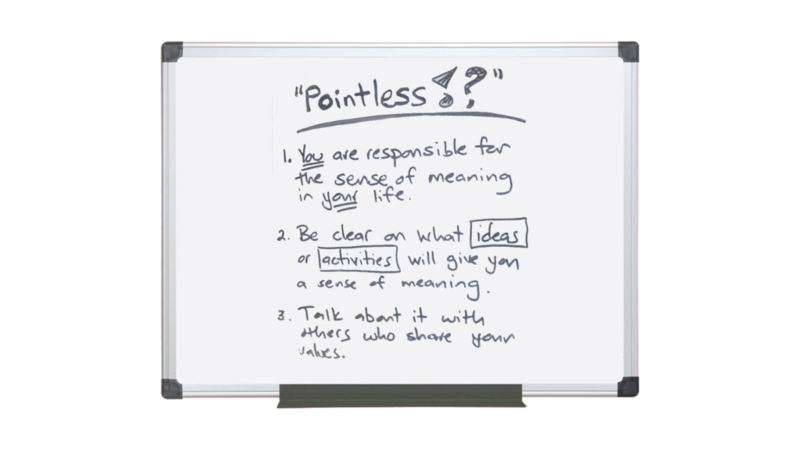 Be clear on what ideas or activities will give you a sense of meaning. For my client, thinking about class and governments is interesting and thus thinking about questions or assignments in a sense of the effect of the subject matter in different classes gave it meaning. For me, I enjoy making artful creative notes. So as long as I can take fun notes, I can make any subject matter meaningful. It’s all about finding the ideas or activities that will give it meaning for you. And finally, talk about it with others. My client talked with me, and I love showing others my notes. By sharing it with others we can help keep our interest high. I hope you all found this to be helpful, and if you want more tips on how to make school and homework less boring, please consider checking out my course, The Anti-Boring Approach. Final Exams Are Almost Here. Do Your Students Know How to Study?